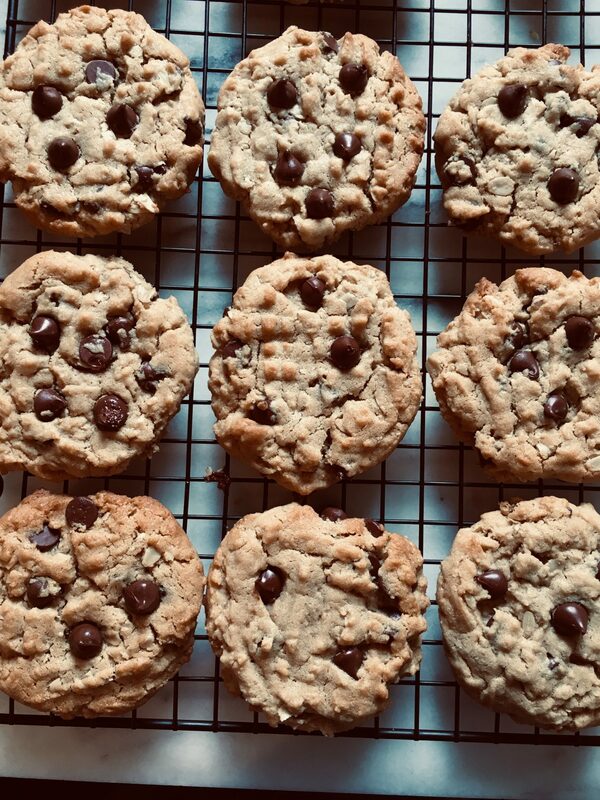 For chocolate lovers out there on Valentine’s Day, here I present heavenly peanut butter chocolate chip cookies. If you want to make something sweet for your sweet, this is for you. Making these delightful cookies is easier than you think. All you need is one bowl to mix the ingredients and then bake it. In 8-10 minutes these addicting cookies are ready to devour. Use a large ungreased baking, or line it with parchment paper. If you can find Guittard chocolate chips, I find that they’re the best to use here. 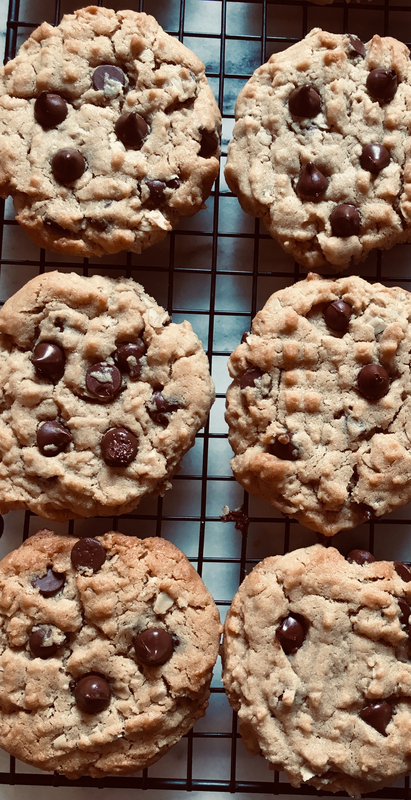 Although chocolate chips are already mixed in the dough, a few more studded on top before baking results in a prettier cookie. Use a big fork to press a crisscross pattern. Do not overbake cookies, as they’re better gooey inside than dry. So I hope you try making these tasty cookies for dessert on Valentine’s Day. And remember, cook with love! Preheat oven to 350ºF. Cream butter and sugar in a large bowl, beating until light and fluffy. Add egg, vanilla and peanut butter, beat until well combined. Sift together flour, salt and baking soda in another bowl. Add to egg mixture, beat well. Scrape the sides of the bowl and beat again. Stir in oats and 3/4 cup chocolate chips. Shape dough into balls (about 2 Tbsp each). Place it in a large cookie sheet about 3 inches apart. Dip a large fork in flour and gently flatten each ball making a crisscross pattern. Top each cookie with a few more chocolate chips. Bake cookies in batches in the preheated oven in the middle rack for about 8-10 minutes. When cookies are done, let it cool in baking sheet on a wire rack for 5 minutes. Then take cookies out of baking sheet and let cool completely on the wire rack.